Jointed lure. With its slight exaggeration of Rapala’s unique baitfish-in-distress behavior, the Jointed gets the undivided attention of otherwise uninterested gamefish. This articulated, or “broken back” lure can be fished like the Original Floater, top to bottom. It is the perfect choice after a cold front, when fish are traditionally finicky and in a negative feeding mood. Extra noise and action produced by the jointed body helps wake up the fish in poor visibility. This articulated lure permits more of that wiggling action fish can’t seem to resist. 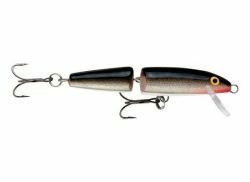 The Jointed Rapala is ideally suited to an extremely slow retrieve without sacrificing any of that famous action. Use it when casting windswept shorelines. Keep the lure just below the surface. The pronounced action will attract attention and trigger fish that are actively feeding on windblown morsels. Also suited well for slow trolling at speeds just around one knot (1?1.5 mph). For added attraction and great strikes, keep your rod in hand while trolling and twitch the lure every now and then to break its rhythm.